Location 225 km S.E. of Melbourne. Yarram is an aboriginal word for plenty of water. 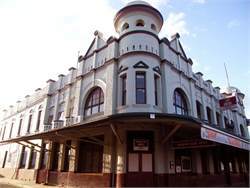 Settled in 1845 its first industry was a flour and saw mill on the Tarra River in 1857. But it soon grew in prosperity, as farmers preferred its proximity to Port Albert. Dairy farming dominates local industry. 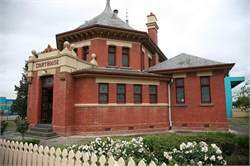 The impressive former courthouse in the main street is an architecture gem and now houses an Art Gallery and Visitor Information Centre. Tarra Bulga, National Park - 25km north - This park is a remnant of the magnificent mountain forests that once covered the entire Strzelecki Range. 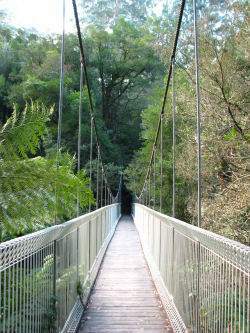 Its 1,560 hectares are noted for their moist, lush fern gullies, beautiful tree ferns, towering mountain ash and its famous suspension bridge. The splendid forest is full of songbirds, including the master mimic, the lyrebird, which can be often found along its network of walking tracks and shorter nature trails. The rainforest information centre at Balook is open at peak times to provide excellent interpretation of the Park and to display reminders of the early settlement of the area. A barbecue/ picnic area, with toilets and shelter, is provided. 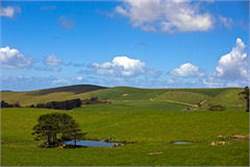 White Woman Waterhole - 20 km N. E, - Located in the Won Wron State Forest at the junction of Napier Road and Lowes Road 5km east of Won Wron. A 2 km walking track has been made through the nearby forest. Yarram Memorial Gardens - 15 km NW - The Barbecue area at the Memorial Gardens is a great place with play ground to enjoy a family lunch. Hiawatha Falls and Minnie Ha Ha Falls - 25km West. There is a delightful picnic area at the falls. Visit the Historic Alberton Cemetery Port Albert Road, Alberton - The cemetery has been restored by volunteers. Burials in the cemetery date from 1842. An information sheet is available from the Museum. Visit Tarraville and inspect the historic Christ Church. - This church was opened in 1856 and has recently been completely restored. It is remarkable for the fact that no nails were used in its construction. Jack Smith Lake State Game Reserve. - Immediately to the north of Woodside Beach and accessible from Byrnes Road, Stringybark Lane or Middle Road. There is an extensive network of tracks. The reserve is particularly attractive to bird watchers. Toora Wind Farm - A new sight on the skyline when you journey down the South Gippsland Highway towards Toora are the turbines of the Toora Wind Farm.